Conserving the planet's biodiversity is greatly handicapped, in that only a small fraction of it (∼14–75%) has been described so far. Integrative taxonomy is making significant inroads in light of this challenge by incorporating multiple data sets across a wide range of disciplines that simultaneously elucidate phylogenetic structure and delimit species-level lineages within a unified species concept. An integrative taxonomic approach to the classification of the gekkonid genus Hemiphyllodactylus Bleeker, 1860 reveals that it is far more diverse than posited by a recent taxonomic revision based solely on morphology, and that it is composed of at least 19 species, most of which are montane upland or insular endemics. Three new species (Hemiphyllodactylus dushanensis sp. nov., Hemiphyllodactylus jinpingensis sp. nov., and Hemiphyllodactylus longlingensis sp. nov.) from southern China previously considered to be subspecies of Hemiphyllodactylus yunnanensis (Boulenger, 1903) are elevated to full species status, and 10 new species-level lineages ranging from Vietnam, Laos, Thailand, Myanmar, Peninsular Malaysia, the Philippines, and Indonesia are identified. 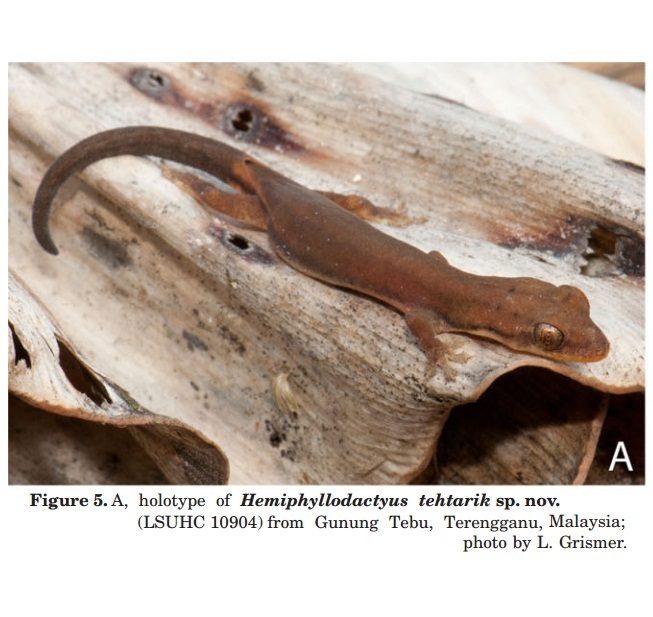 One new species, Hemiphyllodactylus tehtarik sp. nov. from Gunung Tebu, Terengganu, Peninsular Malaysia, is described herein, and is differentiated from all other species of Hemiphyllodactylus on the basis of morphology, colour pattern, and an 18.1–31.5% sequence divergence from all other congeners. Hemiphyllodactylus larutensis (Boulenger, 1900) is removed from the synonymy of H. harterti (Werner, 1900). Using an integrative taxonomic approach imbues the revised classification of Hemiphyllodactylus with more objectivity, stability, and phylogenetic history, while identifying undescribed species-level lineages in potential need of conservation. 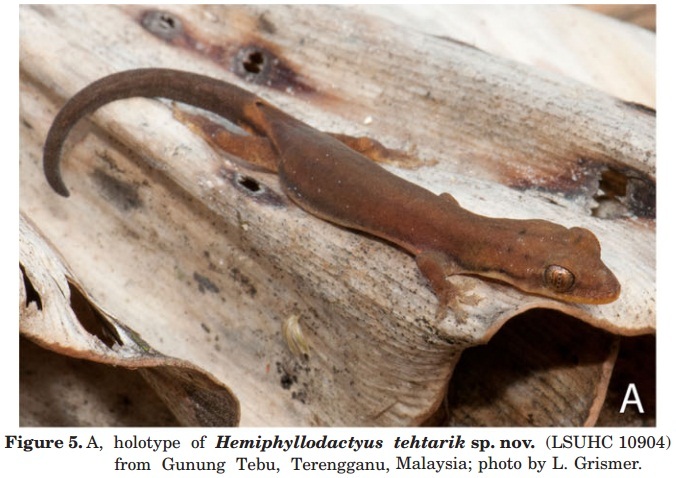 Currently, there are three species of Hemiphyllodactylus recognized from Peninsular Malaysia (Grismer, 2011a): the widely distributed unisexual H. typus and the bisexual, upland species Hemiphyllodactylus harterti (Werner, 1900) from the Banjaran Bintang, and Hemiphyllodactylus titiwangsaensis Zug, 2010, from the Banjaran Titiwangsa. The latter two species are endemic to their respective mountain ranges, and make up the harterti group (Fig. 4). We report on a gravid gekkonid collected during an expedition to Gunung Tebu in the Banjaran Timur found at 600 m a.s.l. We assign this specimen to the genus Hemiphyllodactylus for having undivided, U-shaped, terminal lamellar pads on digits 2–5 of the hands and feet, free terminal phalanges that are not united with the lamellar pad, a clawless, vestigial first digit on the hands and feet, lidless eyes with vertical pupils, and for lacking a ventrolateral fringe or fold of skin extending between the axilla and the groin. However, this specimen is not referable to any known species of Hemiphyllodactylus in that it has a rust–orange, unicoloured dorsal body pattern, no white postorbital spots, and a lamellar foot formula of 3-4-5-4: characters not known from any other Hemiphyllodactylus. Additionally, it bears a unique combination of other morphological and colour pattern characters that separate it from all other known congeners. We consider this specimen to be a member of the harterti group given that it is the sister lineage of H. larutensis (see below), and describe it herein as a new species. Distribution: Hemiphyllodactylus tehtarik sp. nov. is known only from the type locality on Gunung Tebu, Terengganu, Peninsular Malaysia (Fig. 4), but is expected to range more widely throughout this portion of the Banjaran Timur. Natural history: The holotype was seen at night on the leaf of a palm tree (Licuala sp. ), approximately 1 m above the ground, along the edge of a small stream coursing through large granite boulders. During a first attempt to capture it, the lizard dropped to the ground and escaped, but was captured later that night on a different leaf of the same tree. The holotype is an adult female carrying two eggs, indicating that the reproductive season of this species extends at least through August. From only a single female, it cannot be determined if H. tehtarik sp. nov. is unisexual or bisexual. Etymology: This species is named after a traditional Malaysian tea, Teh Tarik, which bears the rich orangish coloration of the holotype. It is a well-established fact that the world's biodiversity is woefully underestimated (Mora et al., 2011), and that most species with broad distributions across environmentally heterogeneous regions are rarely a single species, but rather complexes of generally cryptic species. This is especially true in tropical regions such as Southeast Asia, the dynamic and complex environmental history of which (Hall, 1998, 2001, 2002, 2012; Woodruff, 2003, 2010; Bird, Taylor & Hunt, 2005; Outlaw & Volker, 2008; Reddy, 2008; Cannon, Morley & Bush, 2009; Cannon, 2012; Gower et al., 2012; Morley, 2012; Richardson, Costion & Muellner, 2012) has contributed greatly to the phylogenetic and phylogeographic structuring of a number of wide-ranging clades thought previously to be single species (e.g. Matsui et al., 2005; Stuart, 2006; Inger, Stuart & Iskandar, 2009; Wood et al., 2009, 2010; Grismer et al., 2010b, 2012a; Malhotra et al., 2011; Brown et al., 2012; Johnson et al., 2012; Nishikawa et al., 2012; Loredo et al., 2013). The infusion of a molecular phylogenetic data set into the morphology-based classification of the wide-ranging genus Hemiphyllodactylus not only contributes to this growing body of knowledge, but highlights the inherent tendency of morphological data sets to underestimate biodiversity in taxonomic revisions of widespread groups. Zug's (2010) characterization of Hemiphyllodactylus as a ‘low diversity taxon’ is emblematic of this problem, in that this group's diversity was underestimated conservatively by as much as 113–162%. The molecular phylogeny of Hemiphyllodactylus (Fig. 1) facilitated an independent test of the morphology-based taxonomy (Zug, 2010), identified a minimum of ten (perhaps as many as 13) additional lineages for consideration of species-level designation, and resulted in a less subjective and more stable classification upon which others can build. Some (i.e. Isaac, Mallet & Mace, 2004) posit that studies such as these: (1) result in taxonomic inflation because they tend to use lineage-based species concepts as opposed to a more ‘stable’ biological species concept; (2) impede macroevolutionary studies because they generate asymmetric taxonomies across groups, making them incomparable; and (3) generate unnecessary challenges for conservation efforts. We argue that rather than inflating taxonomies, an integrative approach based on a unified lineage concept (de Queiroz, 1998) actually reveals the true structure of biodiversity, and will ultimately enhance conservation efforts by bringing to the forefront the entities (i.e. species, management units, etc.) in actual need of conserving. The resulting taxonomies are not only more species rich, but are more stable because they are inextricably bound to methodologically and conceptually less biased molecular data sets, and are delivered from the pluralistic outdated biological species concept that is difficult or impossible to apply to allopatric lineages, and often misrepresents the history (e.g. see Frost & Kluge, 1994). Recent taxonomic work across the broad spectrum of life is revealing that nature is considerably more diverse than a polytypic species concept (Mayr, 1963) would lead us to believe. And if we are to forward a sincere effort in an attempt to stem the biodiversity crisis, we need to know upon what to focus our efforts. The very broad distribution (from the Mascarene Islands to Hawaii) and generally conserved morphology of Hemiphyllodactylus illustrates the limits of a morphological taxonomy in the delimitation of species boundaries for such groups. Considerable work on this group is still necessary before we gain a clear understanding of its diversity. The genetics of many of the known populations from Vietnam, Laos, Cambodia, Thailand, and throughout the islands of Indonesia, for example, remain unsampled. As additional material becomes available, we will use the phylogentic taxonomy hypothesized here as a foundation upon which to build future taxonomies. Infusing this taxonomy with molecular estimates of phylogeny allows for a more fine-grained analysis and greater potential for discovering species-level lineages and distinct management units that may be of special concern and in need of conservation (Hodkinson et al., 2012). ป้ายกำกับ: 2013, Conservation, Cryptic species, Gekkonidae, Hemiphyllodactylus, Herpetology - Frog; Reptile Snake, Integrative Taxonomy, Peninsular Malaysia, South Asia, Southeast Asia, Squamata, Zool. J. Linn. Soc.